← EVERYTHING WE HAVE IS A GIFT FROM GOD! WHAT I LEARNED FROM MY DAD – AND A LITTLE BARN SWALLOW! OBSERVATION: “Dad – please don’t say that prayer!” I am a bit ashamed to admit it, but these were the words that came out of my mouth as a child when my Dad would quote this Scripture as our prayer before we ate. Of course, my Dad quoted the old King James Version that started with – “The eyes of all waiteth upon Thee O Lord…” I used to call it the “Eyes Prayer”! To be honest, back then, I never really heard the message of this prayer, but now it’s truth is a wonderful comfort to my heart. 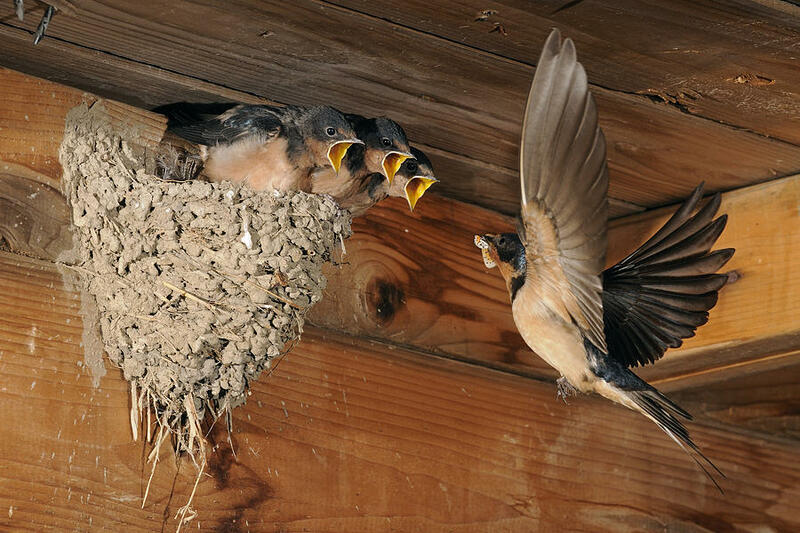 Each year we have a family of barn swallows that come and build nests at our house. There is one family that builds a nest on our back porch, and another that builds a nest on our front porch. The position of the nest on our front porch has become an ongoing battle. This year, the front porch nest fell down during the winter. When the birds arrived again this spring they began rebuilding it right in the middle of the archway of the porch, right under the main entry to our home. The battle was on! I never realized how quickly these little birds could build. Before I knew it the nest was up, and so was my ladder. I quickly removed the nest and asked the birds to find another location. Well, my “bird speak” is not quite developed yet, and they did not get the message. Day after day they continued to try and rebuild, smack dab in the middle of our entry way. I would say – “Please build in the corner!” Did they listen – NO! Three more times I removed the starting attempt of these little birds. I sincerely prayed, “Lord, please help them get the message and build their nest in the corner!” The next morning, a spot of mud was on the corner where the nest had been last year. Within a couple of days the nest was completed and now we have a mother sitting on her eggs safely on our front porch. 4 Responses to WHAT I LEARNED FROM MY DAD – AND A LITTLE BARN SWALLOW!